Creative imbalance and making the most of what you’ve got. It is the only word I’ve managed to come up with in trying to describe what’s been going on of late, imbalance. I’ve got a fair idea about where it’s come from and it has taken me a while to get to grips with it. Rather than castigate myself for allowing it to happen, it has been much easier to recognise it for what it is and deal with it through action and a little reasoning. This imbalance stems from a shift in my working life over the last few months, and hence my creative output, which I’d not accounted for. Although my role is only part time, it has involved a lot of idea generation and thus a massive amount of drawing and sketching. Big projects, which require a lot of this kind of thing in their early stages, need sustained creative input and masses of ideas. It’s exhausting, creatively and physically. Where I went wrong is not remembering this to be the case and failing to keep any creative energy in reserve for my own stuff once I returned home. So it’s been difficult to draw, but more to the point, it’s been hard to generate ideas. I’m showing you a couple of pictures of my garden shed, here in my back yard, as it has proved to be the answer to coping with this imbalance. Rather than spend any more time staring at blank sheets of paper the solution lay in getting out there and making something, turning raw materials into something else, using some tools and getting my hands dirty. 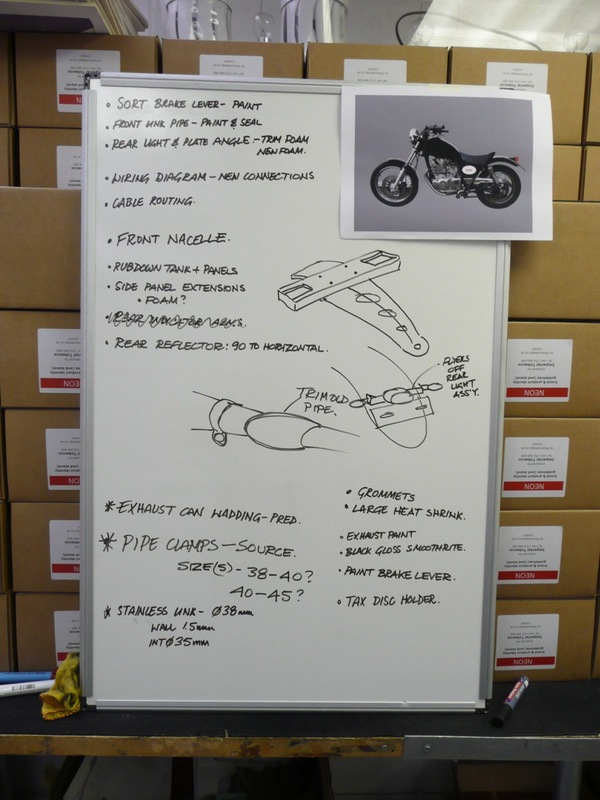 There had been a plan in the back of my mind for a while to refresh the little 250cc motorcycle that I’d modified some years ago when I started this blog. Over the years, as the miles have racked up, it has suffered the usual knocks and scrapes that these things are victim to, and overall the finish was starting to look very tired. I wanted to give it a freshen up, and make some changes to the overall design that I’d not got right first time around. So what to do for a making project was all ready and waiting, I just had to start. 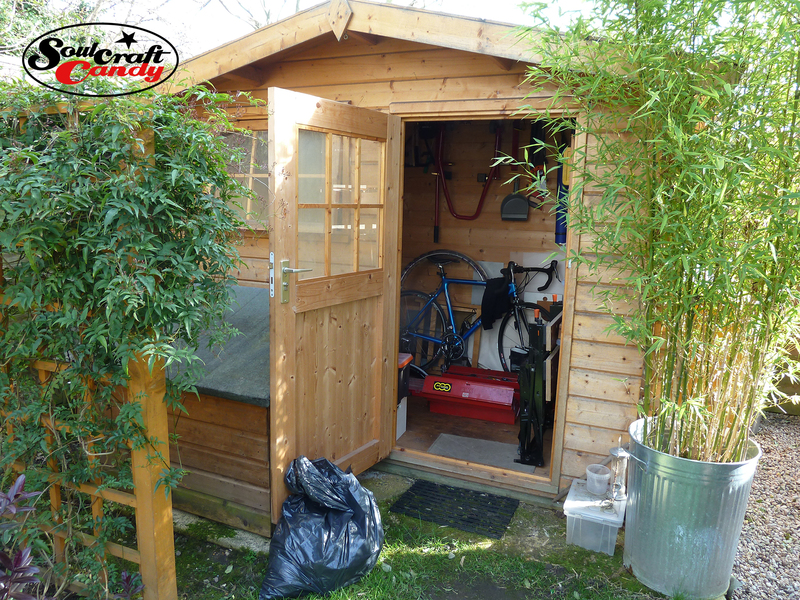 Before now I have relied on using workshop space owned by other people, this time around I didn’t have that option so my little shed was going to need to be the work space that I could use. As you can see it’s a small building with very limited floor area, but it does have an electricity supply, a big light on the rafters and a work bench across one end. It houses all of my various tools, materials and other useful stuff accumulated over years of working as a prototype builder and modelmaker. Being of a sturdy design and construction it allows all manner of things to be hung from the walls, freeing up floor area and permitting at least a modicum of organisation. I don’t own any large machine tools, I’d need a bigger shed if I did, so most of the work would be done with hand and power tools with my trusty old Black and Decker Workmate acting as a secondary work bench. The only thing I can’t, and likely won’t do in there is spray paint, that will have to happen elsewhere. The shed was here in the garden when we moved into the house and I’ve always wanted to use it as a making space. now was my chance to put that thought into practice. It just about fits in. 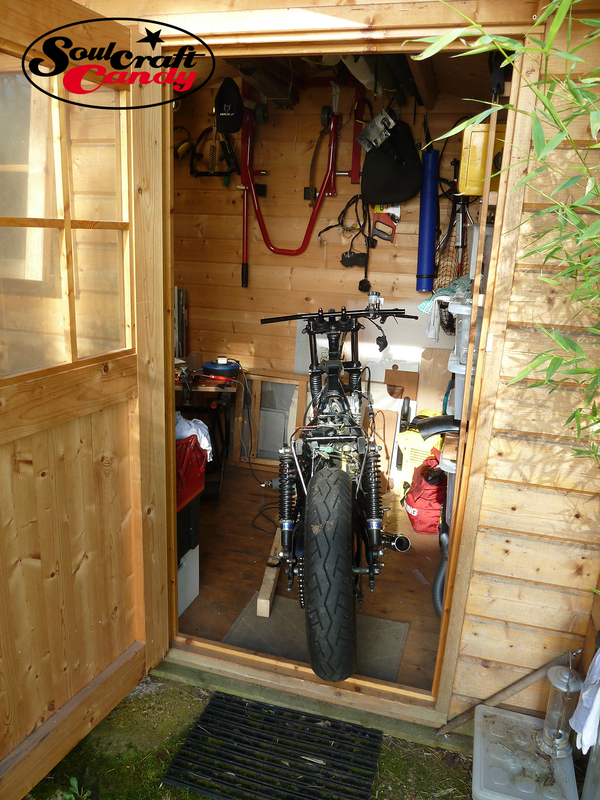 The third shot shows the bike pretty much in the shed. I didn’t need it completely inside, just enough to get some soldering done on the electrical loom, but it meant that I could work on it in there if the weather took a turn for the worse. 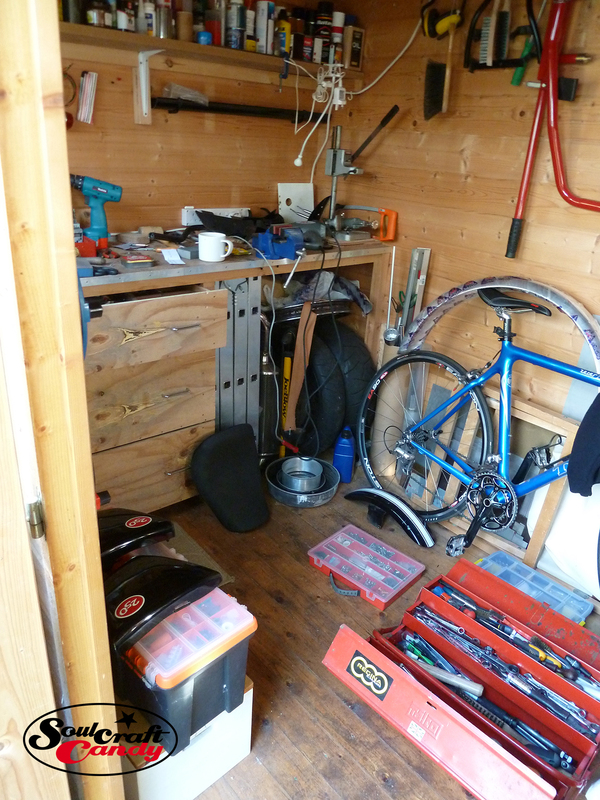 By being methodical and tidying up as I went it was utterly surprising what I managed to do in this small space. Most of us work in some kind of organised chaos. Some cope well the more chaotic things are, others less, and over the years my natural inclination has veered toward the organised rather than the chaotic and this is a boon when working in a confined space. Having everything to hand helps too but, the order one maintains around oneself really is reflected in how one deals mentally with the making process. The fruits of my labours are in the next post. 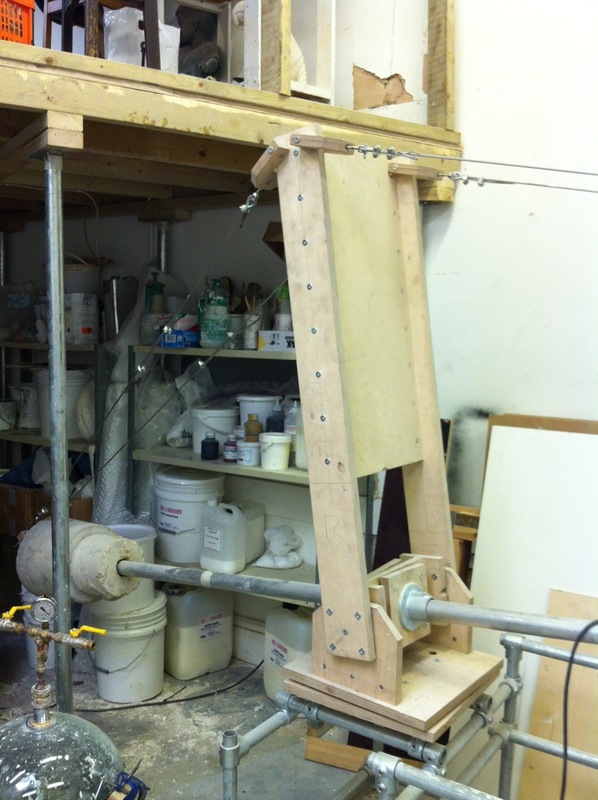 The 3D Pantograph Club, Part 2: Jon’s Machine. The Pantograph, finished and installed. 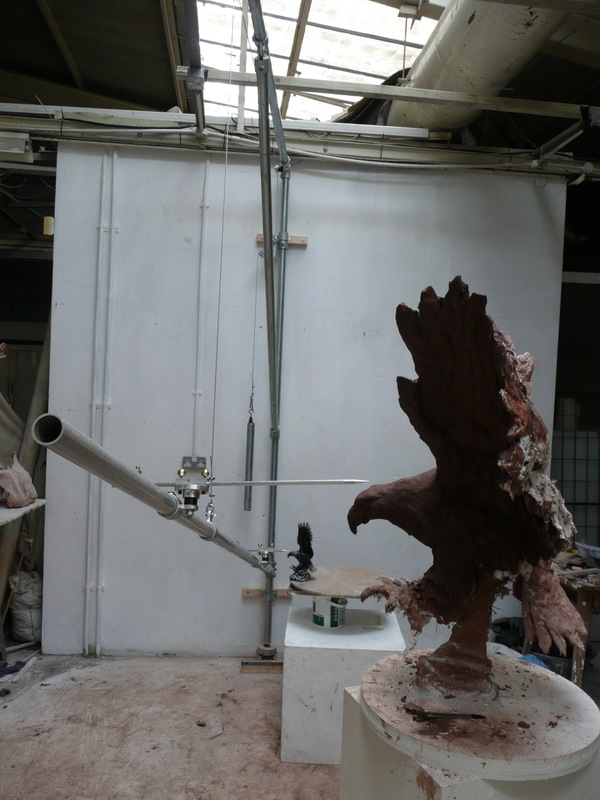 In the previous post you will have read my story about a 3D scaling pantograph built by my sculptor friend Ed. As I also mentioned, my and Ed’s friendship started after we realising we shared a passion for motorcycles and an interest in these rather esoteric sounding pantograph things. So in this post I’ll shed some light on how it all came about. 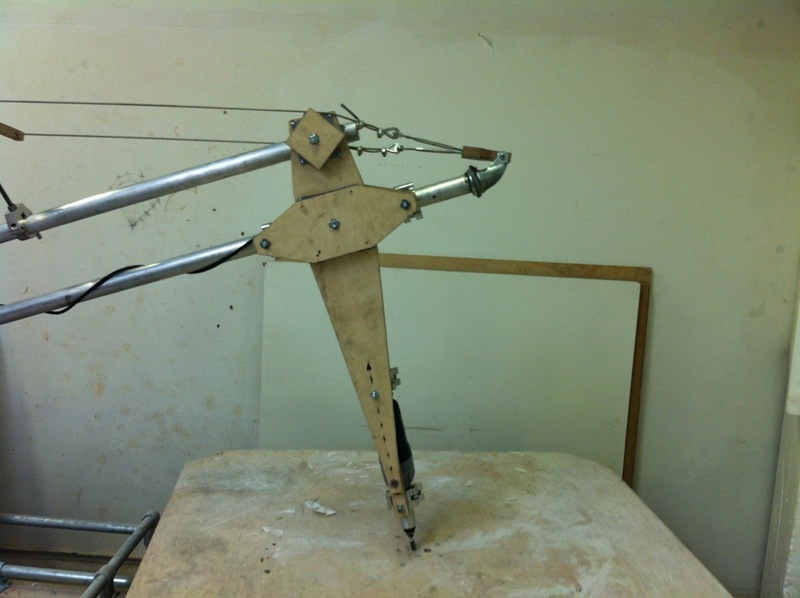 The 3D pantograph, pictured above and covered in this post is a machine I built for a young artist a few years ago after being recommended for the work by another modelmaker. It is in some ways quite different to the one built by Ed, though in others it shares many similarities. There are no given set formats for these machines and so each is a direct response to a brief from the person who’s going to employ it. In my case the machine was to be wall mounted and capable of achieving quite a high level of accuracy, with variable scaling ability anywhere from 2:1 to 4:1. The artist sculpted in clay so no cutting actions needed, purely surface finding. As a consequence, this variability and need for precision dictated many of the design and fabrication decisions taken during construction, not forgetting the ever present need to work within a tight budget. 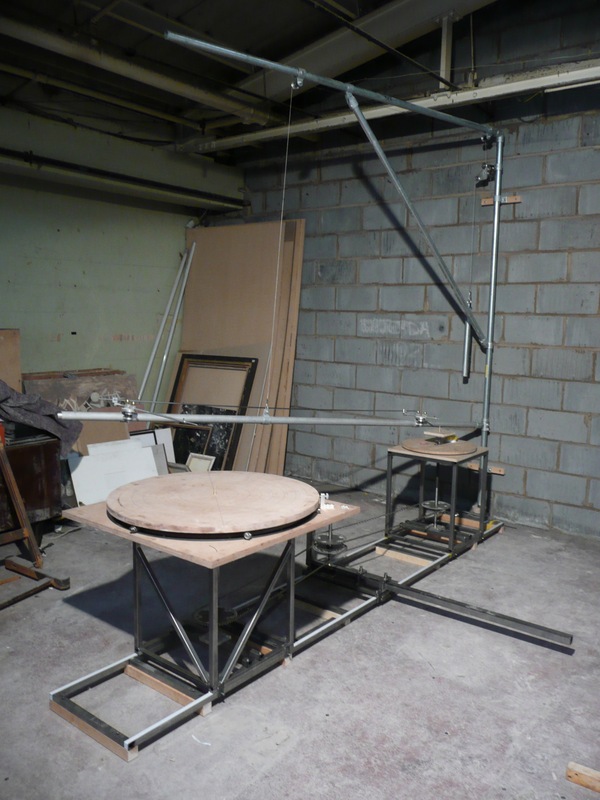 The Cheverton pantograph used for reproducing scaled sculptures in alabaster. To be honest I had never heard of a 3D pantograph when the job first landed in front of me, but all became clear as I took to the internet and arranged to go and visit one, currently residing in the archival warehouse of the Science Museum here in London. 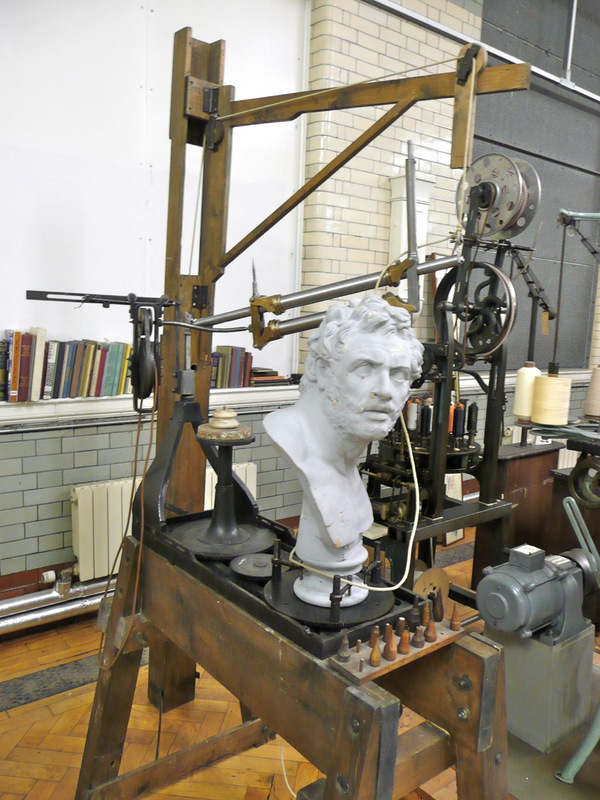 This particular machine was known as the Cheverton pantograph, named after the victorian industrialist who designed it for the manufacture of carved alabaster busts from scale models. It is a beautiful machine, quite a bit smaller than I imagined and a great example of a style of engineering design, lots of architectural references, so loved by the victorians. I freely admit that this machine heavily influenced my design, though it must be said that aside from some mentions of odd machines in America and Italy there is very little out there for the budding pantograph builder to study in order to construct their own. 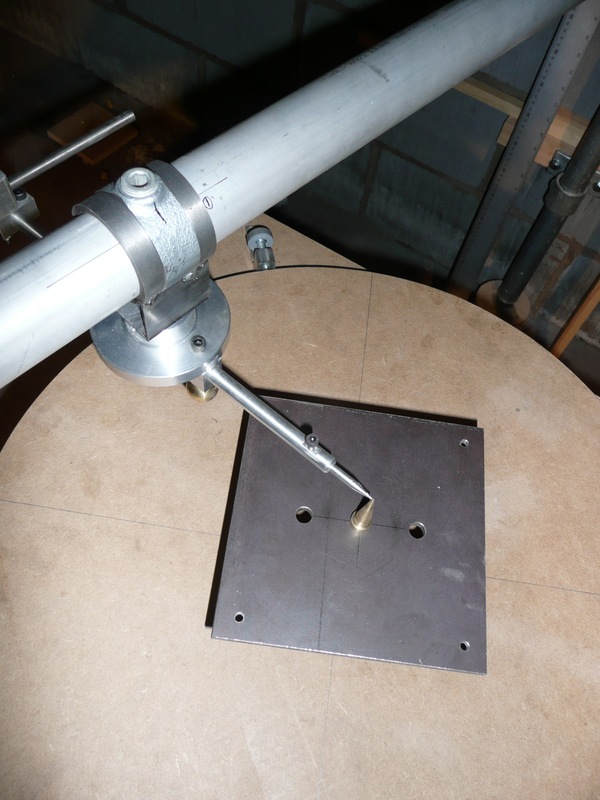 The Cheverton machine showed very clearly the pivoting arm for scaling pointer mounting, the different length pointers for achieving correct scaling and most important of all, a compact system for creating the two rotating turntables that enable the sculptor to access all points around a form. The first iteration in the studio showing basic scaling function. The image above shows the very first iteration of the machine temporarily installed in the artists studio. You can gather roughly how it works from the position of the two pointers relative to the positions of the two eagle sculptures positioned on the boxes. This was very much a prove out exercise, to make sure we were on the right track and to confirm some aspects of the geometry whilst I was building the rotating table structures. Because there was little or no documentation covering the detailed design of these things, it was quite a challenge to work out the exact geometry which governs how the machine works, and thus achieve the level of accuracy demanded by the artist. We encountered many problems to start with but overcame them once we’d realised what was going on. The essential premise is this: Firstly, the exact centre of the ball joint at the root of the moving boom needs to be on exacly the same line as the centres of the two scaling pivot joints. These three positions must be aligned by a straight line in space. Secondly, another straight line must pass through this ball joint and the two tips of the pivoting pointers. And finally, this latter line must also pass through two points at the centres of the tops of both of the rotating turntables. Simple enough you’d think, but a devil to work out without prior knowledge. 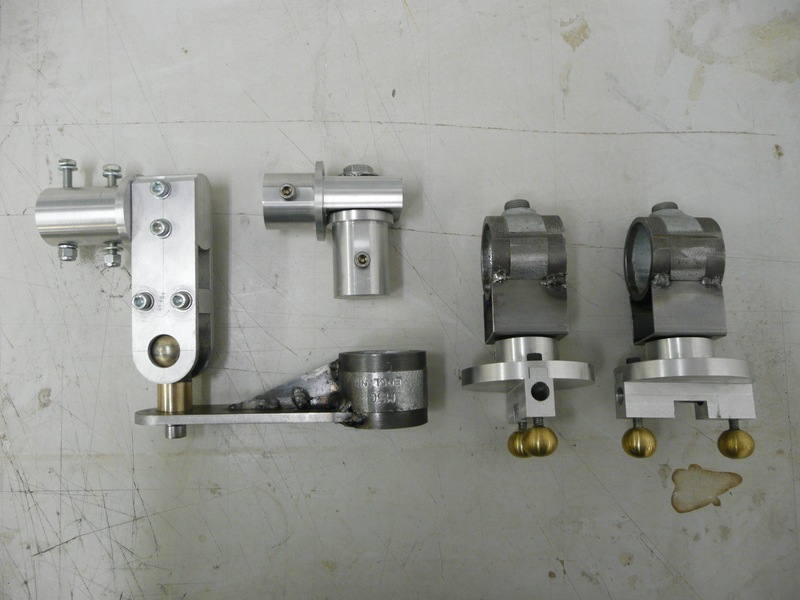 The main pivoting components made using machined scaffolding parts and a lot of aluminium. The scaling function of the machine is achieved through the relative positions of the pointer pivots along the main boom. For example, if the scale required is 3:1, then the second pivot would be three times further from the ball joint than the first. So if the first is say 500mm from the ball, then the second would be 1500mm from the ball joint. The pointers are also of different lengths in accordance with the selected ratio and correspondingly, the relative positions of the turntable centres needs to adhere to these spacings too. This means that for a machine like this, where an infinite degree of variability was requested (anything between 2:1 and 5:1), everything needed to be adjustable and lockable. Hence the pivots slide along the boom, the pointers slide through the pivot blocks, the turntables slide along their guide rails and finally, the chain drive that connects the turntables, which must turn in unison, expands or contracts in order to maintain chain tension across varying distances. Rather than plough on endlessly, I’ll leave you today with some captioned photographs of the build which I hope will serve to fill in some of the background. Sadly I don’t have any more recent pictures, the machine was moved when the artist changed the location of his studio and I haven’t managed to gain access yet. I will keep trying though. Detail shot of the short first pointer locating small turntable centre. Turntables, rails and chain drive under construction. 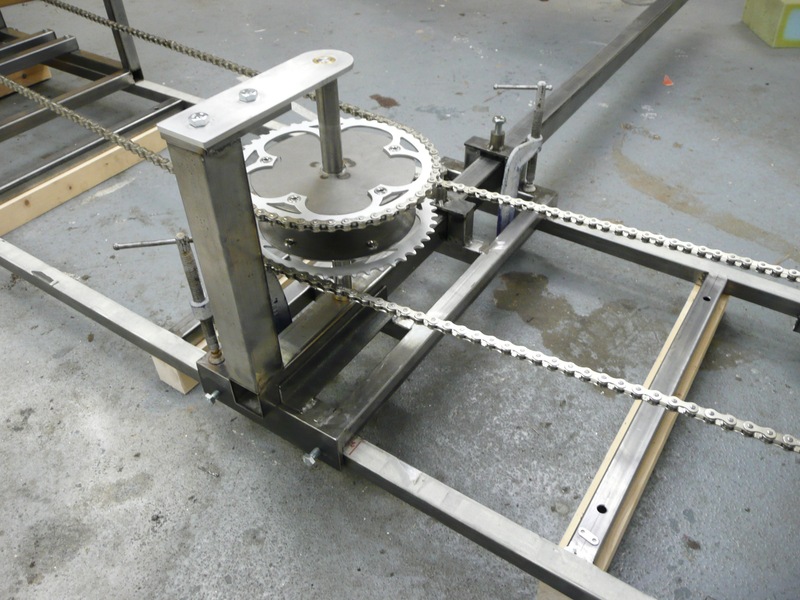 Detail of the chain drive using proprietary bicycle components. The complete turntable and chain drive assembly ready to be installed. 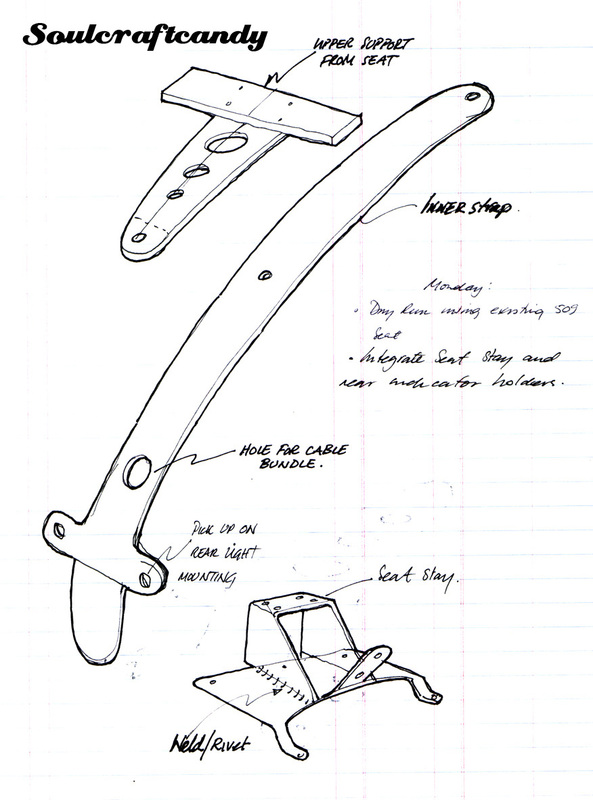 The 3D Pantograph Club, Part 1- Ed’s Machine. Ed and his 3D Scaling Pantograph. It is an inescapable truth of freelance working for creative companies that you are rarely in a position to show or talk about the work you are engaged in, or have just completed. Issues of client confidentiality, and the fact that much of the work is usually a long way from entering the public domain mean you can’t show anyone what you’ve been making for quite a long time after the event. Hence the lack of “making” content on the blog for a long while. Prompted by a recent visit to the studio of a sculptor friend, this is about to change however, as it has nudged me into digging a project out of the archive in readiness to post about it. I first met Ed up at the Ace Cafe, a favoured north London haunt of motorcyclists, where I got talking to him about his fabulous Moto Guzzi. When we discovered what each of us did for a living, and dug a little deeper, it became clear we had more in common that purely an appreciation of personally customised motorbikes. 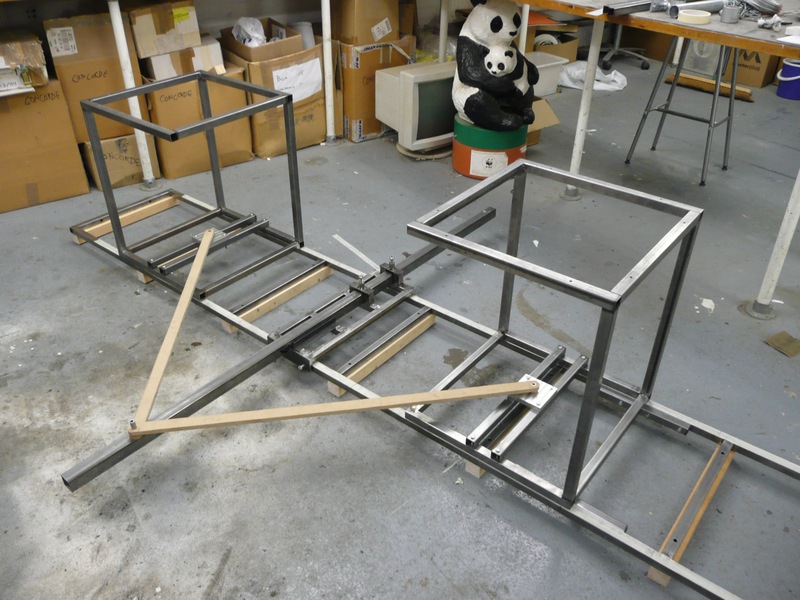 Ed mentioned that he was interested in building a 3D Pantograph, and I had completed the construction of such a device not that long previously. Needless to say he was interested in understanding what my project had revealed regarding these rather esoteric bits of equipment and a good many knowledge sharing conversations ensued. 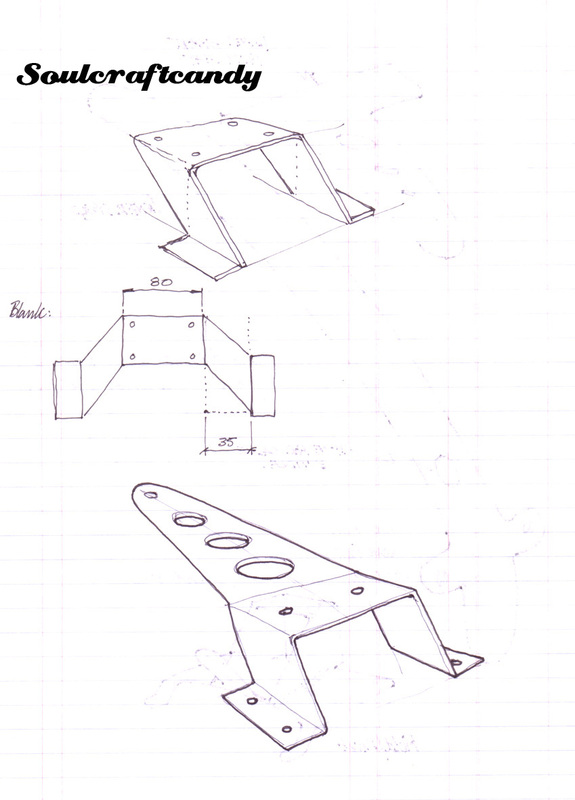 Before going any further though, it is probably best to try explain what a 3D pantograph is exactly. I will try and be brief. A pantograph is essentially a scaling machine that allows the operator to enlarge, and in some cases reduce, the size of an image or object. They are more commonly found in the 2-dimensional realm where they are used to trace lettering or pictures for engraving and such like. Being utterly analogue in their function they have now been generally superseded in most applications by digital technology, so they are rare things to come across. Working from a fixed pivot point, two pointers, connected by a series of pivoting arms allow the operator to follow an image with one pointer whilst the other creates a replica of that image on another surface at a greater scale, like 2:1 say. In 3 dimensions the principle is the same though in this case the first pointer follows the surface of an object, positioned on a turntable, while the second allows the operator to create a scaled up or reduced version of that point in space on a second turntable nearby. If this doesn’t make sense, then I hope that seeing some images and a short film will help to make things clearer. 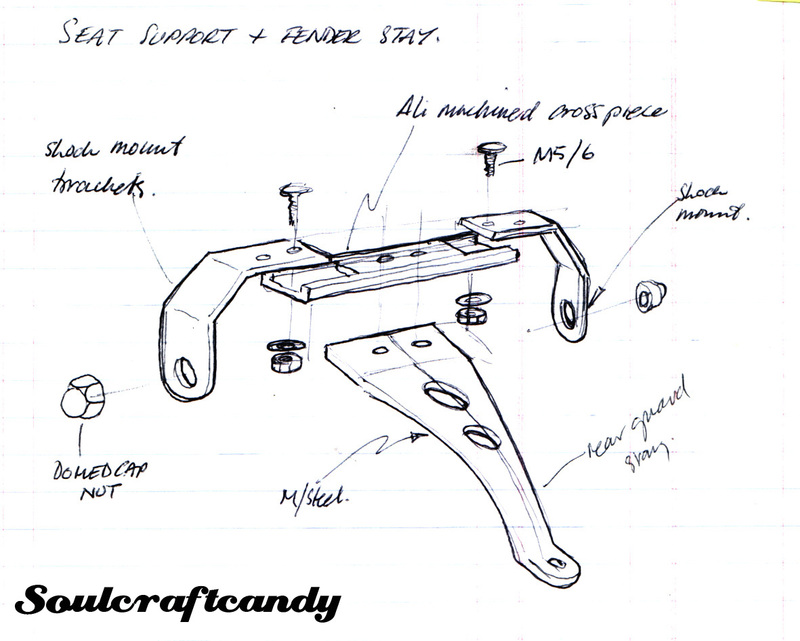 The pantograph pivot and counterweight assembly. 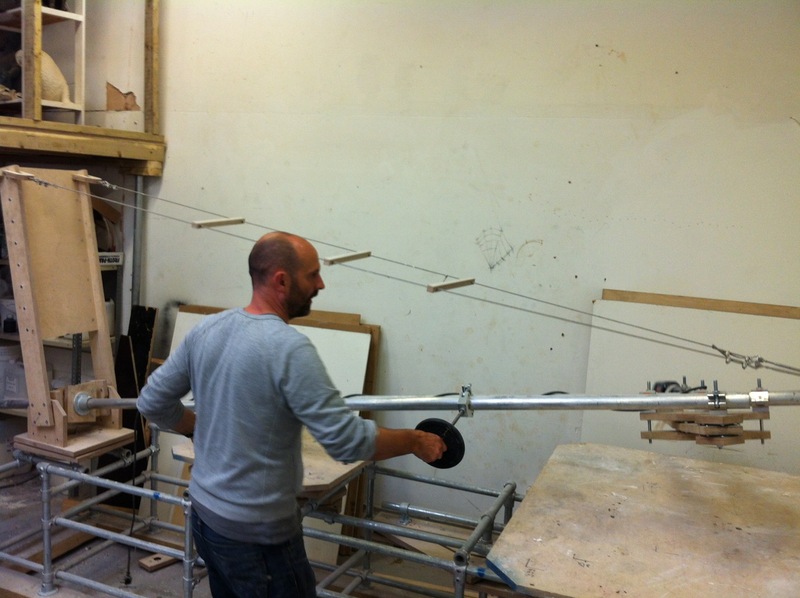 Last weeks visit to Ed’s studio in Camberwell, South London was to finally see the pantograph he had built. It was impressive. Through our earlier discussions we had figured out that these machines could take many forms, it is the core geometry which provides the link between different designs. So not surprisingly Ed’s machine is a very different looking beast to the one I built, and amply demonstrates how a different “brief”, ie what you want to make with it, effects the final design and layout of the machine. Here’s a link to the studio website where you will find a great stop frame film of the guys building their machine and then using it to cut complex forms out of large blocks of expanded polystyrene with a hot wire, and other images. When I visited the studio last week the hot wire had been replaced by a high speed cutting head which the guys had used to carve even more complex forms from similar blocks. 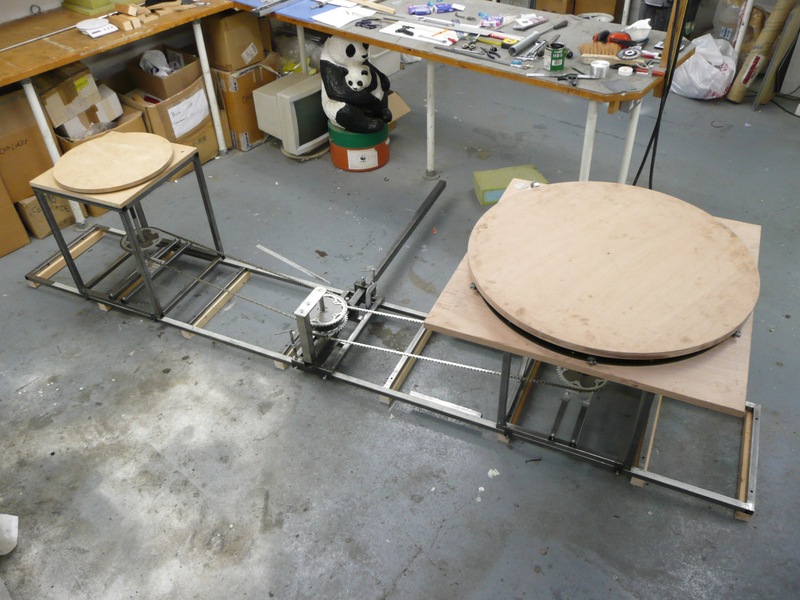 You will also see that the machine consists of the two main elements required for the pantograph to work, a pivoting arm that holds the “pointers” and a pair of connected turntables supporting the final piece and the model from which it is being traced. The business end, a high speed cutting head. In the next post I’ll reveal the details of the machine I put together for an artist, and expand a bit more on how these things work.